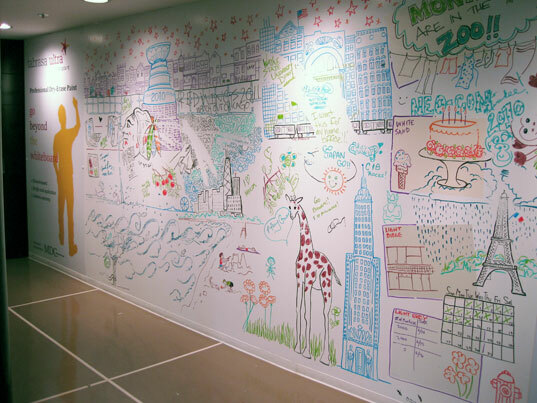 Eco Friendly Whiteboard Paint Turns Any Wall Into an Artistic Canvas! Turn any blank wall or smooth surface into a white board thanks to Idea Paint’s new line of Tabrasa water based paint! The paint was on display at MDC Wallcovering’s booth at this year’s NeoCon World’s Trade Fair in Chicago. The water-based paint only requires a single coat application, comes in five different colors, and has a 10 year warranty. The paint was designed for a number of environments including offices, schools, meeting centers, and hospitals, but we’re personally excited about its applications at home! Thank you for all the positive feedback. IF ever you have any concern about Candy Whiteboard Paint, Candy Paint Asia has a warranty for 10 years. If it is not working, we or our partner will come to fix it a 100% guarantee satisfaction! Thank you Evelyn Lee for a wonderful posting. This is great! A whiteboard with no board! LOL @greatofficedesign - Have you read the \"How to apply the paint\"? That\'s the tricky part. CandyPaint are same with IdeaPaint the only difference is the price which CandyPaint are much more cheaper. Candy whiteboard paint does not work, we have purchased candy paint and tried several markers on it and it is terrible. We end up repainting ideapaint over it. With this information it is very important that these whiteboard paint innovations go a long way in business illustration also in schools, home and offices. These whiteboard paint tool assist me in my business getting a clearer perspective in understanding study and report. Very useful! Why is this "water based" product only available in quarts? Turn any blank wall or smooth surface into a white board thanks to Idea Paint’s new line of Tabrasa water based paint! The paint was on display at MDC Wallcovering’s booth at this year’s NeoCon World's Trade Fair in Chicago. The water-based paint only requires a single coat application, comes in five different colors, and has a 10 year warranty. The paint was designed for a number of environments including offices, schools, meeting centers, and hospitals, but we’re personally excited about its applications at home!